Eternal Love is a 1929 American silent romantic drama film directed by Ernst Lubitsch and starring John Barrymore and Camilla Horn. Based on the novel Der Koenig der Bernina by Jacob Christopher Heer, the film is about two lovers living in the Swiss Alps who struggle to be together and escape their loveless marriages. Lubitsch tells much of the story with very few intertitles, reminiscent of the approach taken by F. W. Murnau in The Last Laugh. 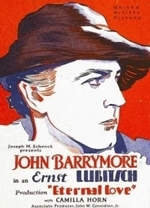 Eternal Love was the last silent film of both Lubitsch and Barrymore. This film was thought to be lost until a 16 mm print was found in the film collection of Mary Pickford, and was released with its Vitaphone music-and-sound effects track in the 1990s.